Official Viwawa Blog: Our first build up game, Eden Story is now live!! After a long gruelling 18 months of hard work, we are proud to announce the Official Launch (Open Beta) of Eden Story! Eden Story is arguably a first of its kind progressive civilization build up game. A gamer starts from the beginning of time, the Stone Age. Through careful resource planning and research, the gamer will aim to progress through the various ages. There are about seven ages in total, beginning from the Stone Age and culminating in the Space Age. This game is extremely fun and will appeal to many of us who always want to know how civilizations have progressed through time. Learn the many wonders of each Age, for example, Stonehenge, Ang Kor Wat and many many more! 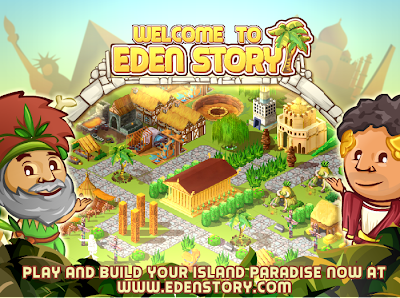 Do like us on Eden Story's Facebook page for more information, and enjoy building the best island ever!